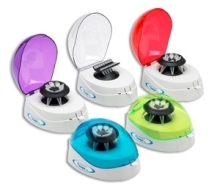 The MyFuge� Mini centrifuge is a personal centrifuge that virtually fits in the palm of your hand. Ideal for quick spin downs of microtubes and PCR tubes, the MyFuge is extremely easy to use. Simply close the lid and the rotor instantly reaches 6,000 rpm. Open the lid, and the rotor quickly decelerates to a stop for removing samples. An increased capacity, eight-position microtube rotor is included and comes installed. Also included is a second rotor for 0.2ml PCR tubes and strips which is stored (together with the rotor removal key) in a convenient compartment on the bottom of the centrifuge. When the rotor is not in use, storage in this compartment prevents loss or misplacement of the rotor.